Things change over time. Famous logos morph from black and white text into ornately embossed colorful graphics. Home screens go from a few icons to pages and pages. Phones go from bricks with numbers to slates with touchscreens. It's just what happens. Little tweaks become overhauls. 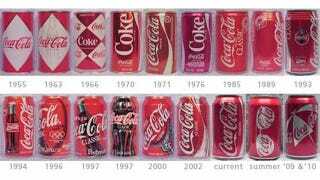 Just look at how your favorite soda cans have transformed. Though Pepsi gets a lot of crap for trying to find a logo that sticks and Coca Cola gets a lot of credit for having the same logo after all these years (other than the New Coke fiasco), both their soda can designs have changed dramatically from its humbly sweet beginnings. Bold Post culled together all these images of soda cans over the years ranging from a 1948 Pepsi to a 1964 7-Up and more. In the early years, it seemed like the design of the whole can changed a lot more frequently while recent years gave way more to little tweaks and additions.